Glaslough village was once again the setting for this year's Monaghan county championship race. Thirty riders from clubs all over the county and further afield gathered at Main Street Glaslough for a gruelling 7 lap race. Emyvale CC had a good representation as had Carrickmacross CC, Navan CC, Keevan CC, Killylough and South Dublin CC. The race was spilt into 2 groups with scratch having a 3 minute gap on the main group to make up in the chase. 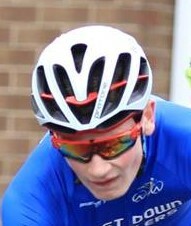 Last night Clann Eireann CC promoted a very successful criterium around the streets of Lurgan for Youth and A4 riders. The senior race for A4's provided an opportunity for many newcomers as well as experienced riders to have a go at this form of racing. Crit racing requires good bike handling skills and the ability to negotiate corners. Expressions of interest are sought from Youth riders (Boys & Girls) interested in being considered for selection for the Inter-Regional Mountain Bike Competitions which will take place on 29-31 July 2016 at Cathkin Braes, Glasgow, Scotland. This event is for Ulster riders in the Under 14's or Under 16's age categories. Ulster will be up against 13 other regions from across Great Britain. Riders must be able to travel over to the games on that weekend. The team can be made up of 4 boys and 4 girls with 1 non-travelling reserve. There are a few events coming up this week starting with the Clann Eireann promoted Lurgan Criterium on Friday night and a couple of leisure cycles at the weekend. With the National Road and TT Championships taking place from Thursday through to Sunday there are no road race events this weekend. Details of events can be see below. Further events may be added when we have full details. Please note Gran Fondo Causeway Cancelled. Lindsay Watson (Plushmtb) showed great form, ahead of this weekend's Beaumont Cup by taking the Kinning Cycles Hill climb. He was 10 seconds clear of runner up Glenn Kinning. Craig Rea (Phoenix CC) was just another 1 second back in 3rd place. Watson will take part in the prestigious Beaumont Cup as part of a strong Ulster Team. Other notable rides came from top Ulster MTB rider Graham Boyd (Xmtb McConvey Cycles) and Rónán Kernan (Castlereagh CC). Last night Ards CC promoted their well organised Town Centre Races beginning with a full programme of events for youth riders. There was a large crowd of over thirty riders aged between 3 and 10 for the novice class which was won by Aliyah Rafferty of Island Wheelers. Last night Old Bleach Cycling Club promoted the Antrim Town Centre Criterium in conjunction with the Antrim Festival. They had a number of races on offer and the club had gone all out to minimise risks with straw bales in abundance around the short, technical circuit. The local PSNI were also on hand to assist the many marshalls around the course. Old Bleach are to be congratulated on promoting such a well organised event.